진평왕 9년(587)에 세운 대승사에 모셔진 보살상으로 유리상자를 씌워 모셔 놓았다. 불상 속에서 나온 관음보살원문(觀音菩薩願文)의 기록으로 미루어보아 조선 중종 11년(1516) 불상에 새로 금을 칠하기 이전인 15세기 후반에 만들어진 것으로 추정된다. 머리에는 화려한 관을 쓰고 있으며, 양쪽 귀에 걸친 머리카락은 여러 가닥으로 흩어져 어깨를 덮고 있다. 귀는 약간 짧고 목에는 3줄로 새겨진 삼도(三道)가 명확하게 있다. 양 어깨를 감싸고 입은 옷은 팔에 걸쳐 내려 무릎을 덮고 있으며, 전신에 걸쳐 화려한 구슬 장식이 있다. 오른손은 어깨까지 들어 엄지와 중지를 맞대고 손바닥을 밖으로 하고 있고, 왼손은 팔꿈치와 수평으로 들어 엄지와 중지를 맞대고 손바닥을 위로 하고 있다. 가슴, 배, 무릎에 표현된 구슬 장식이 경상북도 영덕의 장육사 건칠보살좌상(보물 제993호)과 흡사하지만 어깨와 등의 번잡한 장식이 옷속에 감추어진 점이 다르다. 특히 띠매듭 바로 위의 치마상단이 긴 상체의 가운데에 표현되어 마치 보살상을 둘로 나눈 것처럼 보이게 한 것 또한 이 불상만의 독특한 특징이라 할 수 있다. 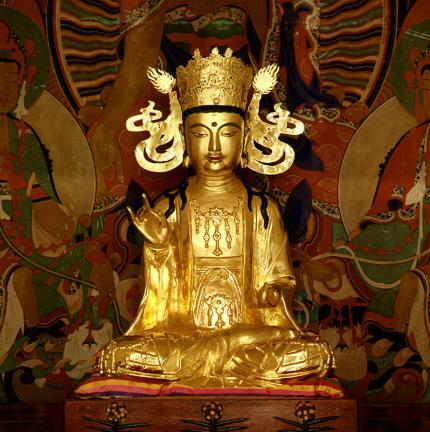 This statue is kept within a glass box at Daeseungsa Temple, which was built in 587 (9th year of the reign of King Jinpyeong during the Silla Period). This statue is estimated to have been made at the end of the 15th century and newly gilt in 1516 (11th year of the reign of King Jungjong of the Joseon Dynasty). It has a magnificent crown on the head, and the hair on the ears covers the shoulders in a scattered way. Both the ears are somewhat short, and the neck has three distinct lines. The robe is draped on the shoulders to cover the arms and knees, with magnificent bead ornaments on the chest, belly, and knees. The right hand is raised to the shoulder with the thumb and second finger touching and the palm facing outward; the left hand is lifted to elbow level, with the thumb and second finger touching and palm facing upward, too. 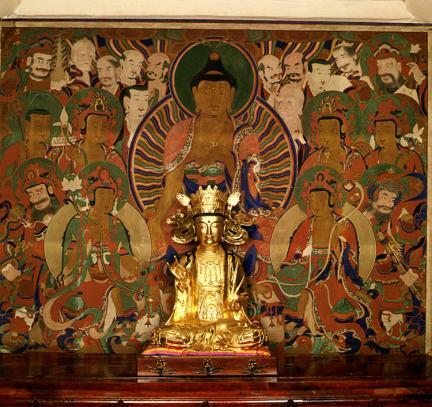 The bead decoration expressed in the chest, belly, and knees is similar to that of the Dry-lacquered Seated Avalokitesvara Bodhisattva of Jangnyuksa Temple, Yeongdeok (Treasure No. 993) save for the complicated decoration of the shoulders and back concealed within the clothes. As the specific characteristics of this Buddha statue, the top of the skirt right above the knot is expressed in the middle of the long top of the body, as if the Bodhisattva statue were divided into two parts.